ScrubPac™ VentClean™ System for Tank Vent Scrubbing - Bionomic Ind. 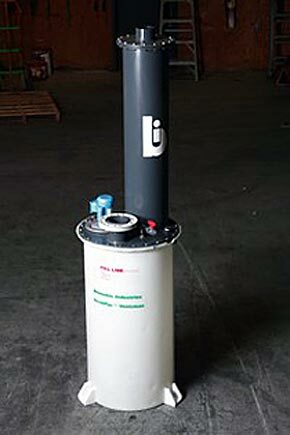 Bionomic Industries exclusive VentClean Scrubber is specifically designed to scrub storage tank and railcar vent emissions caused by breathing and filling operations, and is the latest edition to our enormously successful ScrubPac™ family of "packaged" scrubber systems. Due to its unique design, the versatile VentClean can handle single as well as multiple sources with large variations in venting rates with equally high removal efficiency. VentClean is available in four model sizes L, M, H, and EH to handle gas capacities from 0 to 1500 acfm. 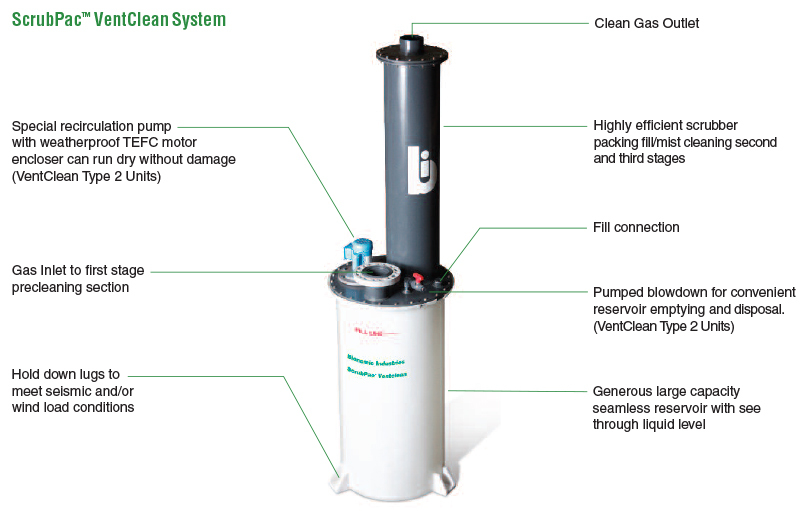 Available in two unique operating configurations, VentClean easily adapts to a variety of scrubbing liquid preferences. Type 1 is economically priced and configured to use water on a once-through basis. Type 2 incorporates a special circulation pump and uses water at a reduced consumption rate, or a chemical reagent such as sodium hydroxide on a recirculated batch basis. Compact, HIGHLY Efficient Scrubber Design can achieve over 99% removal efficiency to meet or exceed EPA and state regulation requirements. For a more complete listing of the applications suited for the VentClean™ Scrubber System, please visit our Industries/Applications section.